Oak Solids with Walnut veneer. Bullnose edge. 42" D x 29.5" H, with three original 12" leaves, one of which with conforming veneer. 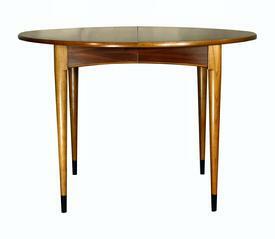 Excellent original condition with attractively figured walnut and oak veneers with oak solids.